"Beginning with my Fast Chicken Soup Base it is easy to knock hours off of the cooking time usually needed for homemade chicken soup and still end up with soup that tastes even better than the 'from scratch' method." 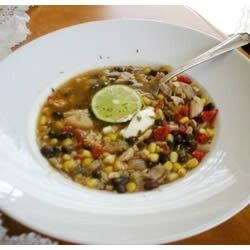 Add these, then simmer until tender, 10-20 minutes: 2 16-ounce cans black beans, drained; 1 10-ounce package frozen corn; 1 14.5-ounce can diced tomatoes; 1 jalapeno pepper, stemmed, seeded and minced; 2 Tbs. ground cumin; 2 tsps. chili powder. Before removing from heat, stir in: 1/2 cup chopped fresh cilantro. Final touch: Add salt and pepper, to taste. Serve soup with tortilla chips, grated Monterey Jack cheese and fresh lime wedges. Way to much cumin for me and my family. I make this soup frequently. It is my absolute favorite. Instead of the base, I just boil a chicken breast with all the ingredients and chop it, put it back into the soup and eat! My kids turned up their noses when they saw the vegetables but once they tasted it they went back for seconds and didn't even pick out the carrots! As with most recipes, I add whatever I have on hand. This time, leftover chicken, cilantro. This is a great light dinner with just enough kick.